The Wisconsin Height Modernization Program (HMP) is designed to improve the density of geodetic control stations listed in the National Spatial Reference System (NSRS) with accurate orthometric heights (elevations). The Wisconsin Dept. of Transportation (WisDOT), in cooperation with the National Geodetic Survey (NGS), initiated a program in 1998 to improve the height data throughout the State. 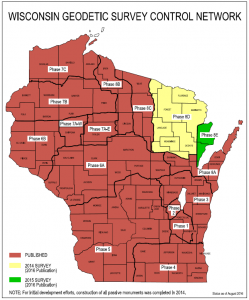 The status of the Passive Network of the HMP as depicted in the image shows how the WisDOT divided the state into geographic regions (phases), based on an area that can be completed based on available funding. The region boundaries depend on both topography and pre-existing NGS level lines (a series of bench marks for which elevation has been established). A policy has been developed to replace HMP geodetic control monuments which are disturbed or destroyed as a result of improvement projects. This policy defines the roles, responsibilities, and funding necessary to replace and re-establish HMP geodetic control monuments impacted by improvement projects. The WisDOT’s Geodetic Survey Unit, with considerable cooperation from local government officials and other stakeholders statewide, is responsible for the core functions of replacement and re-establishment of geodetic control monuments that are disturbed and/or destroyed. Replacement monumentation and survey campaigns are planned and conducted periodically throughout the year, as funding is made available. Please report endangered HMP geodetic control survey stations by calling the toll free 866-568-2852 by email geodetic@dot.wi.gov or fill out the online condition report form Survey Station Condition Report.